← Up a tree K.I.S.S.I.N.G. I thought I’d give you (both) an update on the progress of the Silly Girl’s Project (also known as the Big Road Trip from Dunfermline to Monte Carlo). Part one is here. Look – my grandparents did it in 1955 and it’s not very far at all when you’re leaving 3 children at home and taking off with your wife, brother and sister in law for a jolly. A few weeks ago, while thumbing through the photo album of Douglas and Elsie’s trip, I was gripped by a moment of sheer genius. After due consideration of all the pros (lots) and cons (one, but it’s only money), I announced to the world that Mr IP and I were going to do the road trip to Monte Carlo just like my grandparents did in 1955. We had a somewhat animated discussion after he read the blog, but he thought it was a splendid idea. This is quite fortunate as his car is a vital component in my plan. I’m very keen on this idea and the flashes of brilliance are popping up with amazing regularity. From a road trip, it morphed into a road trip in costume – 1950’s costume. We rushed off to Armstrong’s Vintage the following Saturday and had a good rummage and left with one fedora (his). Naturally, I only saw one item that I deemed eminently suitable and it was a red flowery dress in the window. Apparently someone else had their name on it already. By chance I mentioned to someone that I was looking for a second hand Singer and she told me that there were several at a charity shop in Bonnyrigg. I whizzed along there a couple of days later and found this little cracker – a Singer 201K (1958, made in Scotland) and nabbed it for £35. I lugged it to the pavement where the lady from the shop (Janet, my new BFF) had arranged for A Man to lift it into the back of my car. This turned out to be Colin, whose fish van occupies the space outside the shop every Saturday morning. So I scored myself two pieces of smoked haddock for dinner at the same time. I’m unstoppable. Janet also told me about that rare breed of shops – the local hardware store – where I could buy sewing machine oil. You know the sort of place – mouse traps, paraffin, teapots and garden rakes. Fork handles – humour peculiar to the Brits. Sadly, Colin had declined to come to my house for his tea so I was on my own at the home end but I managed to grapple the Singer out of the car and very nearly to the front door. Dragging it across the grass was one thing but lugging it up two steps was quite another. An emergency phone call to my brother fixed that problem as he and his mate nipped straight round and put in the hallway, and all for a couple of home made muffins each. 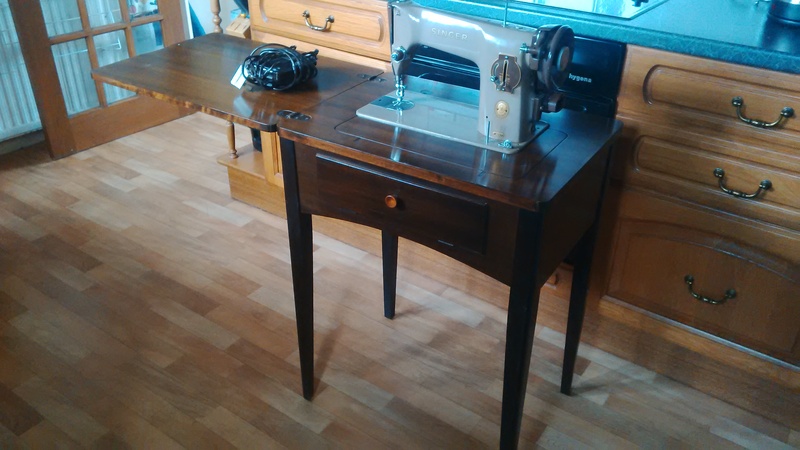 The sewing machine was pretty dirty and dusty and the elderly electrics concerned me a bit, but Mrs ICanDoIt got it cleaned up enough to be allowed to stay in the house. Then I got on T’interwebs to find out a bit about it – well, go me! If I hadn’t chanced upon THE very model of vintage Singer to have. Not only is it the proper sewing person’s machine of choice and made in Scotland, but it’s apparently bombproof and all Singer’s attachments fit all Singer machines. You can call me Lucky White Heather. I’ve got the original instruction book so I knew where to oil it and which bits are supposed to do what but it wasn’t happy. After many phone calls and some increasingly desperate Googling, I managed to download a PDF of “The Singer-201-Service-Adjusters-Manual“. Yes, yes, I know, straying into dangerous territory, but by now there was no going back. After much tinkering and a lot of WD40, a magnifying glass, a torch, an old toothbrush and a shed load of cotton buds, SHE LIVES! I fitted a new needle, threaded her up and managed to sew a stack of kitchen paper together before she fainted. I suppose it’s all been too much for her for one day. I’ll try again tomorrow. Meantime, I’m still working on how to turn myself into Audrey Hepburn. The news about progress on that might be a long time coming. I started by buying liquid eyeliner which everyone says is very easy to apply once you get the hang of it. Ha. Heard that one before. Thankfully, I had the good sense to notice that the packaging says “waterproof, 24 hour wear” on it before I did some face painting then had to go to Boots the Chemist for special makeup remover with a bag over my head. This entry was posted in Douglas & Elsie's 1955 Road Trip, Silly Girl's Project, Singer mania and tagged Monte Carlo, sewing, Silly Girl's Project, Vintage Singer Sewing Machine. Bookmark the permalink. 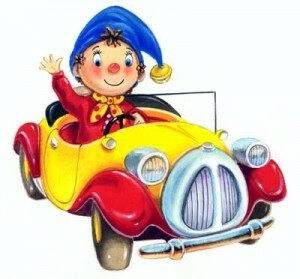 Jo, a road trip in costume sounds wonderful! Good luck with the sewing, now that the machine is alive. Is she still in a faint? Are you going to take a Ferry across to France or the Eurotunnel Shuttle? Looking forward to hearing all about it.